It's a New Year - Time for some Annual Inbox Housekeeping! The New Year is a great time to perform your annual Inbox Housekeeping. There are six key areas that I review at the start of each new year as part of my annual Inbox Review and Clean-Up, or what I like to call “Annual Inbox Housekeeping”. The Outlook Instant Search Tool provides a simple and easy to use set of features that will allow you to search through your Email messages. Don’t waste time filing messages in complex folders - use the power of Outlook Instant Search to find messages for you! Microsoft Outlook™ has a little known but useful feature called Outlook Search Folders. This feature provides a quick and easy way to save you time if you search for the same information over-and-over in your Inbox. In a prior post, we discussed how you can use Outlook Rules to automatically move certain messages to separate e-mail folders as a way to reduce Email Overload. One particularly useful application of this feature is to create a special Outlook Rule in order to create a handy “Reading List”. In a prior post, we discussed the recommendation of utilizing Outlook Rules to automatically route certain messages to separate Email folders as a way to improve your Inbox triage processing and reduce your Email Overload. In a prior post, we discussed some of the challenges of e-mail folders. Now we will look at some specific Outlook Folders Tips and tricks that can help make you more effective and efficient in your use of Email folders. Most users make extensive use of folders to store Email messages, but there are many challenges to using Email and Outlook folders. Folders require creating, naming, and maintaining a folder structure ahead of time. For every message you review and decide you wish to save to a folder, you need to make a decision as to where to store each message. Some messages fit several folders, and some do not fit any current folders, making it difficult to determine where to store a message, or sometimes requiring you to create a new folder before you can store it. In addition, some people make use of automated Outlook Rules that automatically move Email messages to specific folders, such as for mailing lists, newsletters, or electronic subscriptions. Although some find this practice helpful, others find that this just tends to "spread around the work", causing you to have to look for unread messages in more places, instead of leveraging the inbox as a central "to do" list. A flat and simple structure with fewer folders has been found to be most effective and efficient. The time saved on filing has been found to be more than outweighed by the occasional need to use the e-mail system's search capabilities to locate a needed item. Use folders that correspond to high-level categories of work, such as; "Projects, Team, Administrative, or Personal" or "Systems, Corporate, My Group, Reference". Save only what you truly need to reference later – delete the rest. If all you need is the file attachment associated with a message, simply save the attachment to your computer or network drive and then delete the actual e-mail. Try using an "In Process" folder right under your Inbox for storing Emails you have reviewed but require further review or action. Some find this helps to keep the Inbox focused to "new items", but keeps your "in process" messages readily available for easy review. Important Reminder: Please ensure you follow your firm's "legal retention requirements", and save any messages required by your corporate policies or applicable laws. Do you make use of Email and Outlook Folders? If so, do you use only a few folders or a complex folder hierarchy? 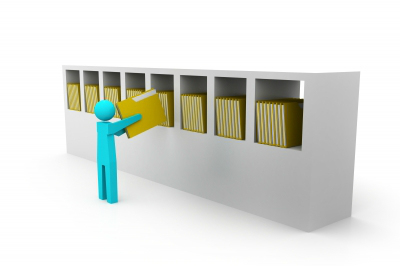 How well does your folder management process work for you? Microsoft Outlook and Outlook are either registered trademarks or trademarks of Microsoft Corporation in the United States and/or other countries.